Good bike ride this morning. I wore bike shorts and they were much more comfortable than wearing regular shorts, which is sort of amazing since I was not sure they are even the right size. The improvement was noticeable. I rode for about an hour. I had the notion to go to Somis, but I’m not a strong enough rider to ride along 118 with confidence, I get tripped up too easily and the cars fly along that route. I’m glad of the opportunity to ride along the arroyo and some on the streets. It was pretty this morning. Calm, overcast, serene. Even so, lots of cars along the part of the ride that was roadway. I’ll stick to backroads for now. I also was eyeing the bike paths of Malibu, which look promising but would require a proper bike carrier. I have no idea how to choose one of those anyway, but since the back seat of the Kia goes down, I might be able to jam the bike in the trunk and bungie the trunk closed as best as possible. I have yet to try that though. The green onions of the picture are the smell Leah and I sometimes smelled when we dropped of the kids. Now we live close enough to bike to see the darn things. Lessons from riding today: bike shorts work for a reason. I got into some mud and it was too slick to really ride in. It was mud right alongside a field, and the texture of the soil along there was so fine, it reminded me of sand – almost no tooth to it the muddy part was seriously destabilizing. Another lesson: uphill is still hard work. I’m glad there are fewer hills here. I’m eager to a time when it’s not so hard to go uphill. And when I say uphill I literally mean almost any incline is hard work. Oh, also, I bought a bike tool and that came in handy tightening my handlebars. Also used my air pump which helped some. I’m still not certain what kind of tire pressure is right. Also getting a better handle on using the gears to effectively get around and still get a workout. My Mom is back from the hospital. CyberKnife, as I said, will be Monday. Prayers to her and all in my family. I appreciate the various comments made here by friends and family alike. Joe Crawford blogged this at 9:32am in 2007 in June. The 17th was a Sunday. You are reading this 12 years later. Comment. There are 3 comments Tweet. Send email. It has hashtags→ photos . bike ride sounds fun! I know its a little far, but there is a nice trail, pretty easy, up by the Jet propulsion labs. 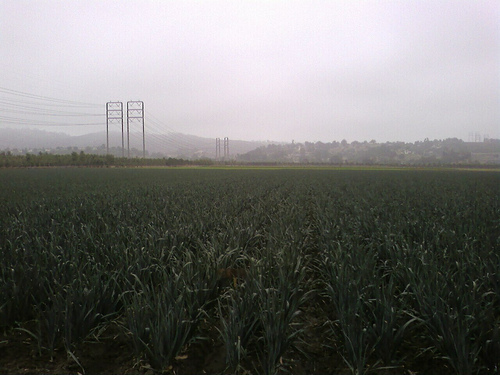 i was wondering if you could tell me specifically where on the map i could find this onion field? Put this into Google Maps: 34.277255,-118.923177 … I think that’s about where it is. If not there, then it’s awfully close to there along the 118 (West Los Angeles Avenue) to the west of Moorpark.